A lump of coal and an Orangery – perfect stocking fillers! You may have to put on your ‘happy christmas present face’ (admit it, everyone has one) if you get a lump of coal There’s no need to pretend to be happy with a new orangery installation though – you’ll be pleased with the combined benefits of an extension and conservatory. If your house feels like it is bursting at the seams thanks to presents, tinsel and a slightly too big tree, an orangery can give you vital extra space. An orangery is like a partially glazed extension – it features brick corner pillars, a partially glazed roof and as much side glass as you wish. This creates a versatile new living space that can be used all year round. If you’ve got all of the relatives coming round for Christmas lunch, or guests to entertain at parties or evening meals, impress them with a stylish new orangery. They feel light and spacious in the day, but cosy and comfortable in the evenings. This makes an orangery the perfect entertaining space, whatever the occasion. The beauty of an orangery being partially glazed is that you gain more privacy and the non-glazed internal walls can incorporate spot lights, plaster, wallpaper and pictures – just like any normal wall. This makes it even easier to show off your personality and style to visitors. Even with the frame colour, there is a choice of hundreds of colours, ranging from traditional to contemporary, and anything in between. Such creative control isn’t possible with traditional conservatories. Bring the outside views in – not the cold! With a lantern roof and as many windows, side glazing panels and doors as you like, an orangery significantly increases the natural influx of light into your living spaces. This is perfect if you want areas to feel spacious and airy during the day, or appreciate the views of your garden or patio when you’re in the kitchen, lounge or another existing room. Even though they bring in natural light, they keep the cold out during Winter. Their fantastic thermal performance only serves to increase the versatility of the space – gone are the days of worrying about a glazed extension being like a freezer! Equally, if solar-control glazing is used, the usability of the orangery during summer is improved, with the sun rays being reflected – reducing stuffiness inside. Orangeres can be used all year round and let you appreciate your home and garden 365 days a year. A uPVC orangery built by K Glazing offers all of the above features – more space, versatility, creative control and a link between the inside and outside of your home. All of our orangeries come with high-quality double glazing as standard, which significantly improves thermal performance. This makes them the perfect place to entertain guests this Winter, whether for Christmas or New Year – no one will need to bring an extra cardigan! With a base in Pontefract, we offer bespoke orangery installations that are tailor made for you wherever you reside across South and West Yorkshire, including Leeds, Castleford and Wetherby. 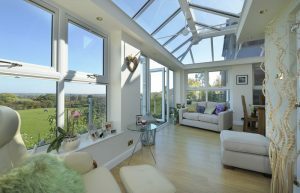 We’ve pleased hundreds of customers with our home improvement work already so don’t hesitate to learn more about our orangeries today. This entry was posted in Conservatories and tagged Orangeries.